The Digital PM Summit 2016 will offer keynotes and breakout sessions presented by top industry experts. Attendees can expect to not only be inspired to get back to work, but excited to act on the tips, tools, and guidelines presented in sessions. Whether you're a veteran or newcomer, you'll find value in sessions ranging in topics from estimating and scoping to managing design teams, and everything in between. Tickets are going fast, so register now. User Experience Expert.Author. Aaron Irizarry. Aaron Irizarry aka “Ron”, is the Director of User Experience at Nasdaq and has been building online products for startups and large corporations for over 10 years. He is also a life long Dodgers fan, heavy metal enthusiast, and co-author of Discussing Design: Improving Communication and Collaboration Through Critique. You can follow his frequent ramblings about food, sports, music, and yes design on twitter at @aaroni. Often times the projects we work on hit rough spots, snags, and even end up in crisis mode. Challenges can come in the form of clients who are tough to deal with, organizational politics, or strife within our own teams. As managers (or leads) of design and product teams we are often looked to for clarity, support and resolution when things go sideways. How do we work through these scenarios as leaders, while managing the expectations of our teams and business partners and keeping things moving forward despite the various challenges that we face? Managing expectations of stakeholders, customers, support/sales/account teams, and even designers. The value of building team consensus before things go into fire drill mode. The design manager’s role/deliverable in today’s design process (shipping is just the beginning). Managing vs. leading and the implications on teams and the challenges we face. Finding the sweet spot between sticking to process and remaining flexible. The balance between execution and maintaining principles. Foresight and avoiding blind spots. Learning what went sideways and how to address it for next time. DPM. What’s that mean? It means Digital Project Manager. Okay? What’s that mean? Think about it—very few people know what it is you actually do every day. Even your mum scratches her head when you explain your job. You need a simple explanation for the awesomeness that you unleash at work every single day. We all do. We also need a set of standards by which we all operate, because there is no path to follow when it comes to DPM. That ends now. This presentation will rally the DPM community around a set of principles that elevate and strengthen us individually, and as a community of practitioners. Let’s get fired up about who we are and what we do! Digital Project Manager at Simple. Caitlin Milligan Sheaffer. Caitlin Milligan Sheaffer is a digital project manager at Simple. She’s passionate about exploring and developing systems of feedback that help people learn from each other. She’s channeled this work at Simple by digging into incident management and postmortem processes. She came to digital project management after spending almost a decade in stage management for live theater. When she’s not at work, Caitlin enjoys practicing capoeira and adventuring in the Pacific Northwest. Does your company “do postmortems” but never actually schedule them? Do you have great learning conversations and then struggle with follow-through? Do you have lots of enthusiastic individual contributors but no buy-in from management? Postmortems can be a great tool for learning, but it can be hard to extract full value from the process. In this interactive, conversation-based session, we’ll discuss what works for your postmortems and what doesn’t. Come ready to share your experiences — if you use some successful strategies in your organization, we’d love to hear about them! We’ll also touch on how and why company-wide support can boost your postmortem work to the next level. Engagement Director, EY Intuitive. DPM2015 Lightning Talks Speaker. Cynthia Schmitt. She has worked with every kind of client from non-profits and start-up ventures to fortune 500 retail, finance, and pharmaceutical companies. She's managed diverse projects ranging from user research engagements to implementing marketing databases. Her clients include: L’Oreal, Jones Apparel, Nasty Gal, Wawa, Bristol Myers-Squibb, Comcast and Synchrony Financial. When not feeding her passion for all things digital, she can be found purchasing cookbooks for decoration or eating out at one of Philadelphia’s many new restaurants. As DPMs we often focus on the process of managing our projects. But, the most critical piece of our role is effectively leading our teams and navigating the many challenges that can arise on a project. This breakout session will be a discussion of best approaches to keeping our teams motivated, selfless, encouraged, and simply...happy. Also, as DPMs how do we keep ourselves present in this type of calming space when things happen unexpectedly? Emily Scala, Director of Project Management at Think Brownstone, and Cynthia Schmitt, Engagement Director at EY-Intuitive have utilized eastern philosophy techniques in managing their project teams, and will moderate this session. Darren was a saxophonist without a gig. Poor Darren. Luckily, he learned about web development and became a functioning member of society. Over time he found himself leading teams of developers, and eventually Darren fell into project management. Like many of us in the digital project management world, he's an accidental project manager. Without a lot of training to be had, it's pretty normal to fall in holes and learn by making mistakes. That's definitely been Darren's path. As a former developer, he retains his nerdy bent for business analysis, process improvement, and practical, meaningful metrics on digital projects. Over the last several years, Darren's been managing projects for Lullabot, an entirely distributed digital agency focused on implementing large Drupal sites. In that capacity, he's had the chance to help produce websites for people your mom has heard of in a variety of industries, including Qualcomm, GE, the SyFy channel, msnbc.com, Angie's List, and many others. When Darren isn't managing projects, he spends time with his wife and kids, and still plays a mean saxophone. You just got handed a project. Everyone is ready to go, and people are shaking hands, clapping each other on the back, and saying how great this is going to work out. As a web developer and project manager, Darren Petersen has blown budgets and timelines, communicated badly, over-promised and under-delivered with the best of them. The good news is that Darren survived, and even learned how to succeed. You will too. Discuss tips, tools and tactics that can make the difference between "ouch" and "awesome"
Bring your questions and your war stories, and let's compare notes! Senior Digital PM. Founder of the DPL Forum in Sweden. As an online Manager and digital project manager in multiple industries like Business/Credit Information, Food and Media Associations, Evy has good knowledge of the challenges a digital team can face in traditional organizations. Continuing her career as a DPM at multiple digital agencies, she also experienced both the joyful and difficult parts of managing multi- disciplinary teams delivering to clients with little digital knowledge. Today she is a freelance DPM with clients on both sides of digital project delivery. Attending DPM Summit 2015, Evy realized the importance of DPMs sharing their experiences, which resulted in her and a colleague arranging DPL Forum, the Swedish version of the Digital PM Summit. She also realized that she has many stories to tell, which is why she is sharing some of her findings. As digital project manager you are quite alone in your everyday work, with many responsibilities and often a high personal need to keep track of everything on your projects. The expectations of a DPM's responsibilities are sometimes as many as there are members in the project. And on top of that, there are demands on your PM deliverables. experiences as a DPM over the years, and how her approach to the role has changed. In this lightning talk, she will present the steps you can take as a DPM to not only survive the day-to-day, but succeed. Inspiration Architect.Founder of Becoming Possible. Doc Waller. Along with being a veteran of the United States Air Force, Doc's background is submerged in the Arts. It spans from performing and touring with professional theatres in NYC (and along the East Coast), national television, and regional dance companies. During those days in the Arts, he independently developed a multitude of original workshops and curriculums (on creativity, voice, poetry) for universities and K-12 schools, as well as a handful of one-man productions performed at theatres across the Southeast. Since stepping away from the Arts in 2012, he has produced a number of independent web series, starting with "On Beauty with Doc Waller." Doc is a speaker alum of both TEDxAtlanta & TEDxHuntsville. He has served as an emcee for national brands, conferences, festivals and organizations, and is also the former founder of an Alabama nonprofit Arts organization called The Layman Group. In 2013, he turned his full focus towards building the Becoming Possible lifestyle brand and is currently based out of East Alabama. We can exist in a vacuum as professionals. As “superhuman” as we’d like to think we are in our craft or business, there’s a smorgasbord of real-life, super human, chaotic elements that are eating away at our well-being and peace of mind on a daily basis. Ignoring these elements is dangerous play. Without a solid personal process in place to face these elements, we become more kamikaze, emotional creatures than efficient leaders, managers and professionals. This talk is about hard truths. This talk is about rebounding and landing well. This talk is about breaking day-to-day chaos down to a human level, and embracing a few tools that we can take into the battle of life in order to maintain our composure and ambition. Program Manager. Consultant. Author. A Girl's Guide to PM. Elizabeth Harrin is the Girl behind the blog A Girl’s Guide To Project Management, which is celebrating its 10th anniversary this year. Based in the UK, Elizabeth is a program manager working in healthcare. She also runs a small business, writing and consulting for a wide number of international project-based organizations. She’s the author of three books and has a raft of qualifications that probably don’t mean much to people outside of project management. She’s particularly interested in stakeholder engagement and team communications and making the whole collaboration thing easier. Elizabeth answers to her name and also pm4girls, her Twitter handle which sometimes people use in real life too. She enjoys growing vegetables, reading and wishes she had more time for manicures. Whether you work in an agency or in-house, you always set out to offer a great service to the people who are getting the end result of your project. Traditionally, project managers finish off projects with a post-implementation review which looks at what went well and what didn’t go so well. The problem with post-implementation reviews is that if you identify things that didn’t go so well it’s far too late to do anything about it. There is an alternative. In this session, Elizabeth will show how her company implemented a programme for continuous customer feedback. The first feedback was a demoralising 4 out of 10 but the project team turned that around. Using her own experience as a case study, Elizabeth will explain how she got results up to 10/10 and will show how you can do that too. Web & Interactive Project Manager. Elizabeth Michalka. Recently, Elizabeth changed jobs and is now a Project Manager at Caktus Group where she is delving into Scrum for the first time. She collaborates with a cross-functional team of developers who specialize in creating custom Django web applications. Previously, as the Web & Interactive Project Manager/Producer at Duke University’s Fuqua School of Business, Elizabeth worked in-house, and managed strategic digital projects as well as domestic and international marketing campaigns. In her small, but mighty team of four, she filled the roles of cat herder, web content editor, SEO strategist, marketing email producer, and mystery solver. During Elizabeth’s 10 years at Duke University in Durham, NC, aspects of people and project management were included in all her roles. She firmly believes that relationships and collaboration are key to success. Prior to working at Duke, Elizabeth was an award-winning newspaper reporter at The Wake Weekly. She earned a bachelor’s degree in journalism from the University of North Carolina, where she also studied Slavic languages, literature, and history. Why Slavic studies? Elizabeth is a first generation American, and her parents are from the former Czechoslovakia. She loves Prague, and highly recommends that everyone go there! She is active in the Czech and Slovak community in central North Carolina, serving as a Meetup organizer and on the executive board of the Czech and Slovak School of North Carolina. Connect with her on Twitter or LinkedIn, or if you also work in higher ed, join the Digital PMs in Higher Ed group on LinkedIn that she co-runs. As a DPM, we need both hard skills and soft skills. For some, the soft skills are a challenge or an afterthought. Think about it – Do you have the mechanics down pat? Do you focus on the project logistics first? So, at what point do you consider the people involved, and your relationship with each of them? If you follow the Project Management Triangle, which focuses on project constraints such as scope, schedule, and resources (mainly budget or costs), then you may be forgetting an opportunity. The Triangle doesn't tell the whole story and is missing a key component; it's missing the opportunity to build and leverage relationships. Relationships are what make the DPM world go-round, whether you work in-house or at an agency. Director of Project Management at Think Brownstone. Seasoned DPM. Emily Scala. Emily has been effectively managing and leading digital engagements for the past 6 years and brings a mindful philosophy to the art of project management. Her distinctive style and ability to move projects and people forward has resulted in successful project performance and client satisfaction. Emily has extensive experience managing diverse accounts for clients such as ADP, Thomson Reuters, JourneySales, and the Hackett Group. Emily also leads Think Brownstone’s PMO and inspires team members to be solution-oriented, master problem solvers, proactive managers, mindful leaders, and articulate consultants who are responsible for delivering against client expectations, scope, and budget. Follow Emily on Twitter. Digital Operations Director at Cossette. Agency Agile Transformation Expert. Garci Inigo is the Group Director, Digital Operations, and head of Agile transformation at Cossette Montréal. Garci has worked in agencies throughout his entire career, and he realized early on that his calling lay in the digital sphere. He plays and coaches rugby, and one day came across a book that used terms taken from his favorite sport. Ever since, he has been a fervent defender of Agile values. For the past two years, Garci has taken charge of the Agile transformation at Cossette Montréal. He serves as a Coach for the entire organization. As well as being a rugby coach himself, Garci trains other coaches, which has led him to draw many parallels between the worlds of sports and business. A voice says, “Let's implement self-organized teams...now"
The Agile Manifesto says, “The best architectures, requirements, and designs emerge from self-organizing teams.” But what does that mean, and where can you buy a self-organized team? There is a lot to consider when in the agency setting. In this breakout presentation, Garci will present the journey of building a multidisciplinary team and using Agile methodologies in an agency setting. Mr. Skeels is a recovering client services and program management executive whose career included leading Sapient’s 105-person Los Angeles office, several years as a RAND Corporation management scientist and graduate-level marketing professor. 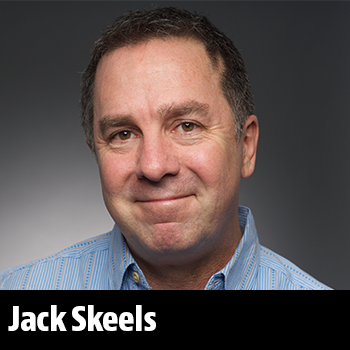 A two-time Inc-500 Award winner, Jack spends his days leading a revolution in agency management practices, including next-generation scoping and estimation methods, self-empowered teams, and delivery excellence. In the last five years, his company has taught Agile-based, self-managed team techniques to over 3,500 agency staff and over 70 agencies. One of the most difficult challenges that agencies face today is that of scoping and estimating new projects effectively and accurately. The most prevalent practices are borrowed from software development – or unrelated industries like construction – and are poorly suited for today’s rapidly-moving and multi-workstream digital shops. Studies have indicated that agency-wide margin losses from poor scoping and estimating often range from 20-45% of sales. This challenge has numerous origins, and only by understanding them can practices improve. Estimation bias across roles, skill levels, types of work, and team/contracting structures. Katie is a Kentucky girl who’s been living in the UK for 10 years and managing digital projects in one form or another for over 8 years - everything from social media campaigns to complex data management and reporting software. The thread that has run through her career is a fascination with technology and a genuine love for the people who make it. She’s currently a senior project manager at Byng and she blogs about Digital PM at her website, KatieBuffalo.com. Katie met her co-presenter Shahina Patel at the January 2016 DPM:UK conference, where Katie was a presenter and Shahina acted as compère, introducing speakers and managing audience Q&A. They are both super excited to debut their double act at the Digital PM Summit. Jira and Trello, Agile and Kanban, checklists, Gantt charts, and burndowns… Pomodoro and Inbox Zero, Slack and Basecamp, Moleskine notebooks and Pilot V-system pens… these are just some of the software, hardware, methodologies, and concepts that can make up a digital PM’s toolkit. A well-chosen and managed toolkit can have a transformative effect on your work (and your life), while a jumble of mismatched, unloved, un-managed set of tools can add stress, irritation, and unnecessary complexity. Remote, Contract DPM. Operations Consultant. Natalie is a consulting digital project manager living in Austin, Texas. Her work focuses on helping growing development and design agencies and in-house web departments manage digital projects, clients services, and implement processes that help design and development teams work better together. She also specializes in implementing project systems across remote teams. Natalie writes about managing remote teams on her site and runs the PM Reactions blog and enjoys dystopian fiction, yoga, and drinking too much coffee. It’s launch day! You and your team have worked hard to achieve this day—the moment when you release your client’s website into the wild, ready to go off and live on its own. But wait! Is the client’s team equipped to handle the growing needs of their new website? Who will be making needed updates? Are others involved in content maintenance decisions? And will your client be able to deal with the design and development needs of the site as the site’s purpose grows? talk about what features make a website sustainable for a client and how to engineer our processes to promote sustainability. work collaboratively to understand how we might use new techniques to help our team adapt to content management-forward thinking and work through a real case study using these new processes. look at how we can help our project teams identify content manager needs; how we can use discovery time to realize commonly missed, intensive requirements; and how to reverse engineer a project process to include ongoing maintenance on the client side. Some of the most difficult roles to integrate in Agile and Lean development are project managers and user experience (UX). Transitioning from big upfront design and massive requirements documents to a minimum viable product and just in time design is difficult to understand and implement successfully. Agility is critical to success in digital business because the market transitions so rapidly and competition is fierce. Natalie will describe key strategies to shift the traditional way of thinking to a leaner model while preserving options for delivery. She will clarify how project managers and user experience professionals can embrace and prosper in this new work environment by using real world examples from some of the large digital retailers in the United States. Accessibility Focused Project Manager. The Jolly PM. Robert Jolly. An accessibility-focused Project Manager with nearly 20 years in the web design industry, Robert has managed projects for clients including Zappos, Georgetown University, Nintendo, Time Inc., American Airlines, JetBlue, and many others. Passionate about accessibility, Robert has spoken at conferences, led training workshops, and brings a whole-team approach to accessibility and inclusive design. When not online, Robert may be found with his family, riding his bike, or at a nearby Waffle House. Check out more of Robert's work on his website. The DPM is responsible for ensuring all aspects of projects run smoothly, on-time, and meet numerous requirements. Often, accessibility is a key project requirement that is overlooked or misunderstood. In this participatory workshop, we'll unpack what it really means for a digital project to be accessible and how DPMs can ensure this requirement is scoped, planned, and executed to successfully meet the requirement. At the same time, you'll learn how to level-up team all project members to include accessibility in their core skill set. Bestselling author and speaker on creativity, management, philosophy, and culture. Scott Berkun is a bestselling author and popular speaker on creativity, management, philosophy, and culture. He's the author of six books, including Making Things Happen, The Myths of Innovation, and The Year Without Pants. His work has appeared, or been mentioned, in The New York Times, The Washington Post, Forbes, The Wall Street Journal, The Economist, The Guardian, Wired magazine, Forbes, USA Today, Wired, Fast Company, National Public Radio, and other media. He studied philosophy, computer science and design at CMU, was a manager at Microsoft ('94-'03) and WordPress.com ('10-'12), taught creativity at the University of Washington, was a co-host of CNBC's The Business of Innovation TV show, and posts regularly at his popular blog at scottberkun.com. Follow Scott on Twitter at @berkun. The Great Big Thing: When Innovation and PMs Collide! Too often we’re asked to make the impossible happen on a lowball budget and with little time. Berkun will share grand stories of success and failure from great projects in history, shedding light on what innovation truly means, the challenges of managing new ideas, and how progress truly happens in the real world. From Her Shed. Suzy Bates. Suzy Bates is the Director of Projects at Four Kitchens. She has experienced all sides of the website building world from being a consultant, client, Project Manager, Project Owner, Internal IT and Implementation Engineer. Lately Suzy has been leading a team of five project managers and product owners at Four Kitchens to deliver projects large and small. Process improvement and tools are her (work) hobby. Suzy works from a shed in the backyard of her home in Austin Texas and only allows communication via texts from her teenagers during the day. Empowering your team to meet their goals is hard enough, now try to do it from a shed. When Four Kitchens went remote, Suzy moved her project management practice from a traditional office to a shed in her yard. In this session, you'll learn what she needed to change, what she didn’t, and how it made her stronger as a PM. We will be discussing what elements of being a project manager translate well to a fully remote environment and some that don’t. How do you translate your success with a co-located team to success with a remote team? What do you need to adjust in order to remain an effective manager for your team and your stakeholders? Shifting to a distributed model can raise new challenges and new opportunities. We will be discussing the right working environment for you personally with tips to avoid loneliness and resist distractions. We will be discussing engagement with your team and stakeholders through video conferencing, email, and chat. Finally, the psychology of human interactions and how to not lose that aspect of engagement through digital interactions. Client Engagement, Atlantic BT. DPM Veteran. Tera Simon. At some point in our careers, we have all attempted to tackle projects that were actual elephants - monstrous skyscraper-like projects that simply swallowed us in the size of its scope. We get lost, overwhelmed, frustrated and impatient. Frankly, we want to bury our head in the sand and hope the project disappears. We bite off more than we can chew and we get choked up. To sum it all up: We fail. We don't finish. The project flops. Everybody is disappointed. It doesn't have to. Whether you're taking on a project solo, or working with a team, you're likely coming to grips with the eating of an elephant. There a steps you can take to find success. It starts with chilling out. In this session, attendees will learn how to take a deep breath and use the right techniques to take on that elephant, one bite at a time.